Are online schools a better option for teen moms – or just a high-tech version of schools that once hid pregnant girls from shame? 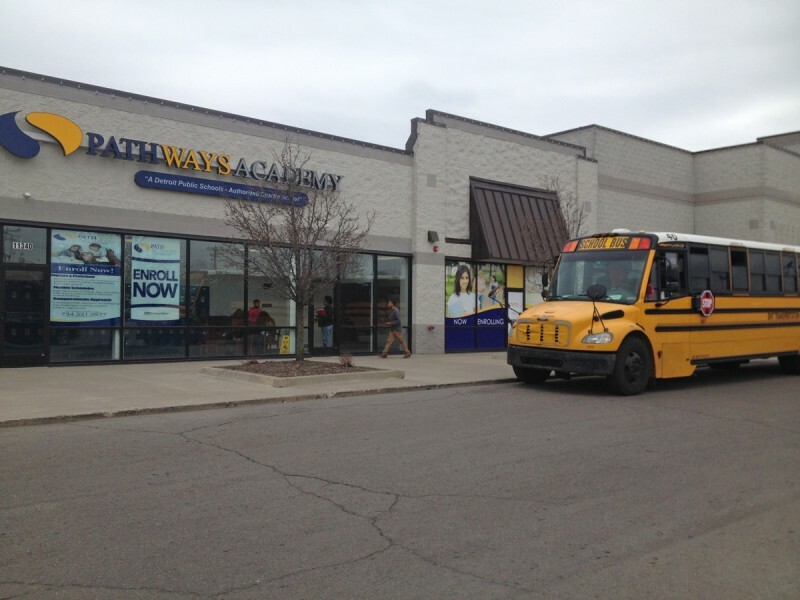 DETROIT – For the first seven months of its existence, the Pathways Academy on this city’s east side had some noisy classrooms – really noisy. Students in an English room on a recent morning were laughing and chatting so loudly – “And you was all wrong!” one exclaimed as her friend burst out briefly into song – that it was almost too loud to hear the babies. Yes, the babies – a 10-month-old babbling on his mother’s lap as she plugged away at her computer, and a bigger boy, Dominic, nearly two, careening around the classroom as he pushed a wheeled chair. Dominic squealed with delight until smashing the chair into a desk and falling back against the floor. “Waaaaaah!” he shrieked as his mom, Alaca Ponds, 18, ran to pick him up. “He’s OK,” Ponds said, cuddling him against her shoulder. 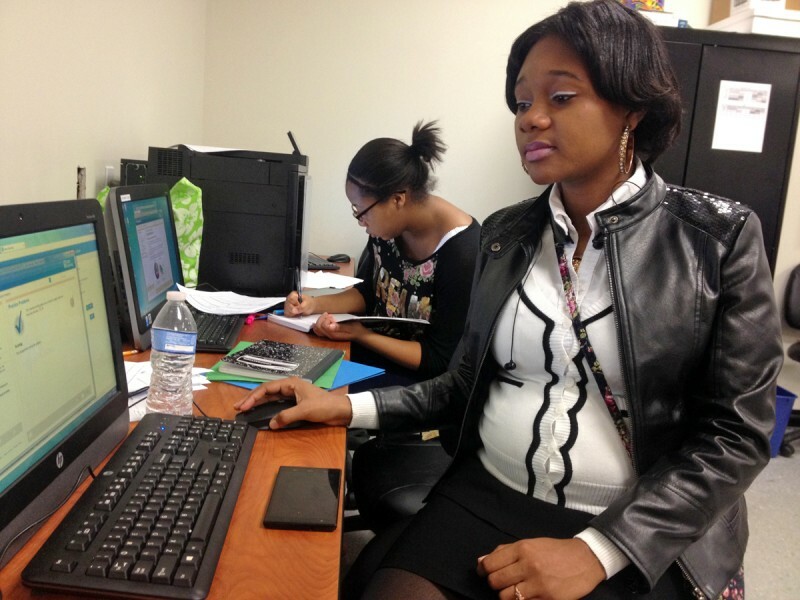 It was not an ideal environment for learning, acknowledged principal Nate King, but Pathways is filling a crucial role for Detroit’s pregnant and parenting teens. This new charter, which opened in a shopping center here in September, is the only school dedicated to young parents in a city that has one of the highest rates of teen pregnancy in the country. So even though the school’s daycare provider couldn’t get licensed in time for the first day of school – leaving some students’ children to play in classrooms and others to watch videos with babysitters – Pathways had to open on time, King said, or many of these students would have had nowhere else to go. At a time when school options for teen parents are drying up across the country, schools like Pathways could – for better or worse – represent the future of education for young parents. At Pathways classes are taught almost entirely online – not by teachers. This means students don’t write research papers or do science labs or engage in classroom debates that could prepare them well for college. But the learn-at-your-own-pace courses seem ideally suited to students who may need time off for maternity leave or to care for a sick child, or who may need to restart their educations months or years after dropping out. Students can stay enrolled even if they can’t make it to class every day, and the lower academic costs in a school with fewer teachers can free up funds for badly needed support services, like counseling and transportation. The students at Pathways say they’re determined to succeed – not in spite of their parenting obligations, but because of them. “When I found out I was pregnant, I just knew I wanted the best for my child because I didn’t have the best,” Ponds said, adding that she wants to go to college – maybe become an engineer – to set an example for her son. While that kind of resolve is common among young moms, programs that once helped teen parents stay in school have been gutted – in part because teen pregnancy rates have dropped to historic lows. Some states and districts that once had robust support programs for teen parents now have no dedicated funding for these vulnerable kids. But teens are still getting pregnant. Nearly 300,000 girls between the ages of 15 and 19 give birth every year in the United States – almost three percent of girls in that age group – and a third of them won’t earn a diploma or a GED by age 22. Less than two percent will earn a college degree by age 30. Their babies are more likely to do poorly in school, to have health problems, to suffer from child abuse, to end up in jail or unemployed and to become teen parents themselves, continuing a cycle of poverty and trauma that can last for generations. To break that cycle, these young parents need intensive attention. They need therapy. Many of the students at Pathways have survived traumatic childhoods or abuse, school staffers say. They need social workers. Some are homeless or live “from pillar to post,” King said. And, except for the lucky few who have a family member willing and able to babysit, they need someone to look after their child while they go to school. But services like those are hard to find in struggling cities like Detroit. Here, almost one in five babies are born to girls aged 19 or younger – nearly 2,000 babies a year – yet no comprehensive high schools currently offer on-site childcare. So computer-based charter schools like Pathways are cropping up around the country to offer an option, albeit a less than perfect one. Schools have opened in Salt Lake City, Daytona Beach, Florida, and other communities. And here in Detroit, Pathways and a second online academy that’s geared toward homeless and older students are the only schools that currently offer in-school childcare. Some advocates for teen parents warn that steering young parents to online classes is just a high tech version of the last century’s pregnancy schools, where girls “in trouble” were banished to hide from their shame. Those schools “were not equal,” said Patricia Paluzzi, CEO of the Healthy Teen Networks, which advocates for teen parents. “They didn’t have AP courses or honor societies or things like that.” But Paluzzi says she has an open mind about the new online schools as long as they’re in brick-and-mortar classrooms like Pathways, where students’ work is overseen by teachers, and aren’t “virtual schools,” where students work from home. 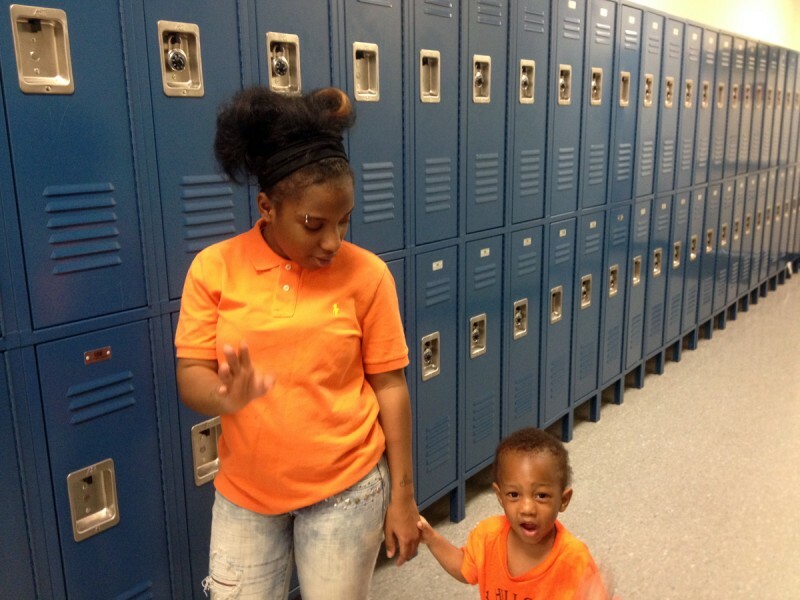 Until last year, Detroit had one of the nation’s most celebrated schools for teen moms. The Catherine Ferguson Academy on the city’s west side had been profiled by Oprah’s O Magazine and by MSNBC for its 90 percent graduation rate – far higher than typical rates for teen moms – and for the small farm that students and teachers built on what used to be a playground. The school required all its graduates to enroll in college, and taught them to care for horses, goats, crops, their children and themselves. But with an aging building and expensive programs, the school was dropped, in 2011, by a district in financial peril. It was briefly rescued by a charter school operator, but sputtered and finally closed last year. The Lawrence Paquin Middle/High School in Baltimore met a similar fate in 2009. After supporting teen parents for half a century, it as merged with a school for older students to save money, then closed for good in 2012. The closed schools are among scores of programs that have shut down around the country. Some were little more than GED mills, but others were treasures offering on-site childcare, health clinics, parenting classes and a range of social services on top of a college prep curriculum. Some cities are making efforts to replace the services, including Baltimore, which next year plans to add a daycare and teen-parent resource center to an alternative program for students who’ve fallen behind. A school in Detroit has a program in the works, too. But critics say too many districts have replaced these schools with little or nothing. When the National Women’s Law Center surveyed state laws and policies in 2012, it found that just 26 states offered services to support pregnant teens and 32 states had no laws expressly prohibiting discrimination against pregnant women or girls. As a result, in many schools pregnant and parenting teens are often bullied by teachers who won’t excuse child-related absences or make accommodations. Pregnant girls have been barred from school activities, pressured to enroll in alternative schools and shunned by their peers. Extreme examples include a Louisiana charter school that until 2012 had a policy of expelling girls who tested positive on mandatory pregnancy tests, and a New Mexico school that forced a girl to announce her pregnancy during a school assembly. But beyond the headlines are young moms like Nicole Adams, who says she was barred from her local high school in Detroit because she was pregnant. Adams had dropped out of high school at 17, but tried to re-enroll a year later when she was about to become a mom. Administrators saw her bulging belly, she said, and told her that the school wouldn’t be safe for her. “They said they didn’t want to be responsible for any harm toward me,” she recalled. She didn’t know that excluding a student because of a pregnancy violates federal law, and she didn’t manage to return to school until three years – and the birth of a second child – later. 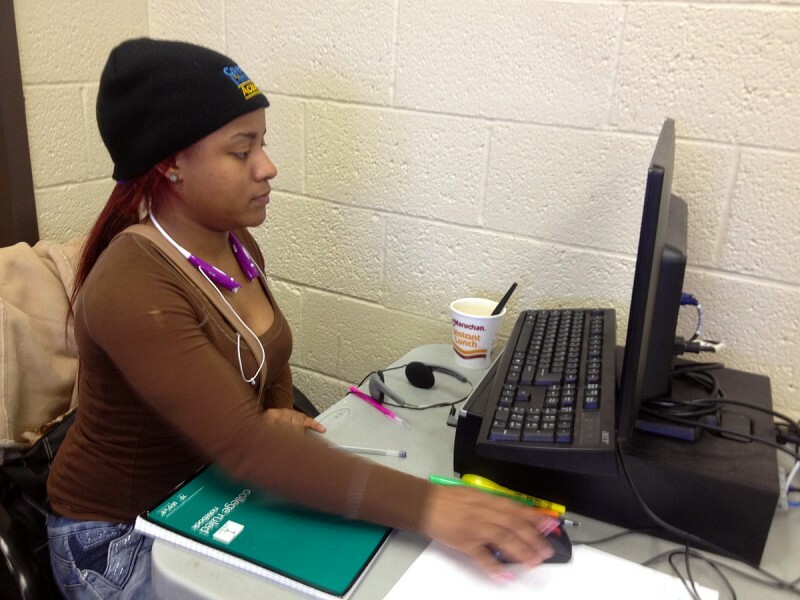 Now, at 22, she’s at Covenant House, a school for homeless kids and overage students who left school but have returned to earn their diplomas. It is the only Detroit school other than Pathways that offers free onsite childcare to students. Another Detroit mom, Bonita, 16, who asked that her last name be withheld, said she dropped out of a suburban Detroit high school when administrators, learning she was pregnant, insisted she transfer to an alternative program. Since her grades were good – mostly As and Bs, she said – she had no interest in what she considered a bad-kid school. Now she’s at Pathways, but says she misses traditional classrooms. Advocates know what young parents need to succeed in school: childcare, counseling, parenting skills. They need access to contraceptives to avoid a second pregnancy, and attention from social workers who can secure housing, food stamps, bus vouchers and other assistance. Some advocates want to see those services offered through so-called “wraparound” programs in traditional high schools, while others prefer standalone programs, like those that were shut down in Detroit and Baltimore. New York City, which closed its academically inferior “P-Schools” in 2007, now offers a range of support services to 800 families through childcare and resource centers at 35 high schools around the city. The $12-million program is the city’s largest source of free childcare. In Denver, those services are provided at Florence Crittenton High School, which was the subject of a 2012 reality show called High School Moms. The school, which began as a home for pregnant girls and morphed into a school in 1983, is a partnership between Denver Public Schools, which handles the academics, and the nonprofit Florence Crittenton Services, which raises $2 million a year to provide therapy, healthcare and quality care for the children of roughly 130 students. “Flocrit” boasts an 80 percent graduation rate, but it’s not the only model that works, said Crittenton Services President Suzanne Banning. 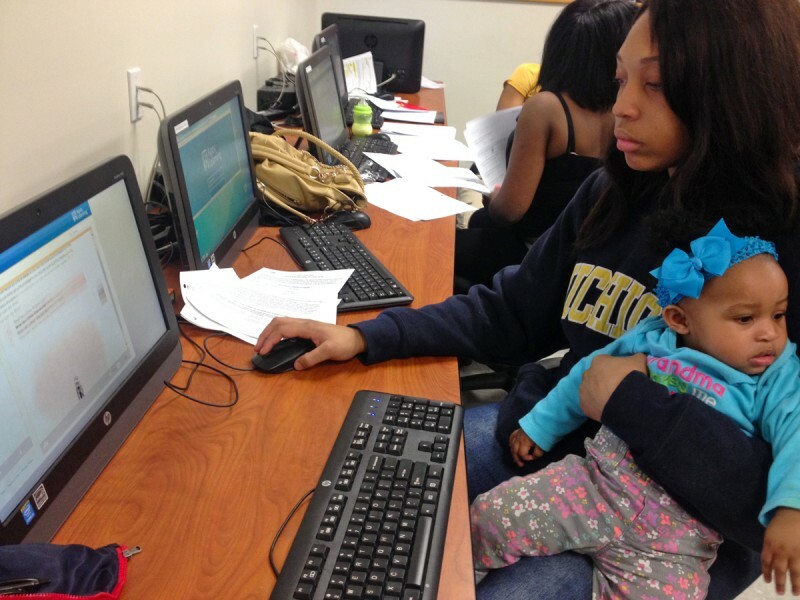 It’s too soon to say whether online schools will be a good choice for teen moms, since schools like Pathways are too new to have much of a track record. Online schools typically have lower academic costs since they can operate in smaller buildings with fewer teachers, said Michael Barbour, an education professor at Sacred Heart University in Fairfield, Connecticut, who has tracked the growth of these schools. Since online schools often get allocated the same funds per student as traditional schools, critics charge that they’re moneymakers for the private companies that often run them. (Pathways is run by the New Jersey-based Innovative Educational Programs.) But supporters say the lower price tag means there’s money left over to provide services like transportation. While Catherine Ferguson students had to travel to school with their babies on city buses – pushing strollers through snow in the winter – Pathways students are picked up at their homes for a ride to class. And once in school, they can access parenting classes, a mentoring program and social services that are provided on campus. In April, Pathway’s child care center, which is run by a nonprofit agency, finally got its license and opened classrooms for babies, toddlers and preschoolers. A school social worker says she’s working with a local hospital to bring mobile clinics to the school so students and their children can get healthcare on site. Pathways students don’t necessarily come to class every day. Of 140 students registered, King said 30 work from home on school-issued laptops, for reasons including maternity leave. Of those expected to be in class, King says he usually has about 50 to 70 in school on a typical day. While King says he’s working to improve attendance, he notes that these students would have much more difficulty in a traditional school where missing class means falling behind. The online model lets students learn at their own pace, reading online textbooks, taking notes, then using those notes to prove their knowledge through online quizzes. If they miss a few days of class, they can pick up their individualized coursework where they left off. By next year, King said he hopes to give students a mix of computer courses and teacher-led traditional classes – a “blended learning” approach that he says will meet more students’ needs. But, for now, he said, he’s focused on getting as many of these hard-to-reach students through his doors as he can. 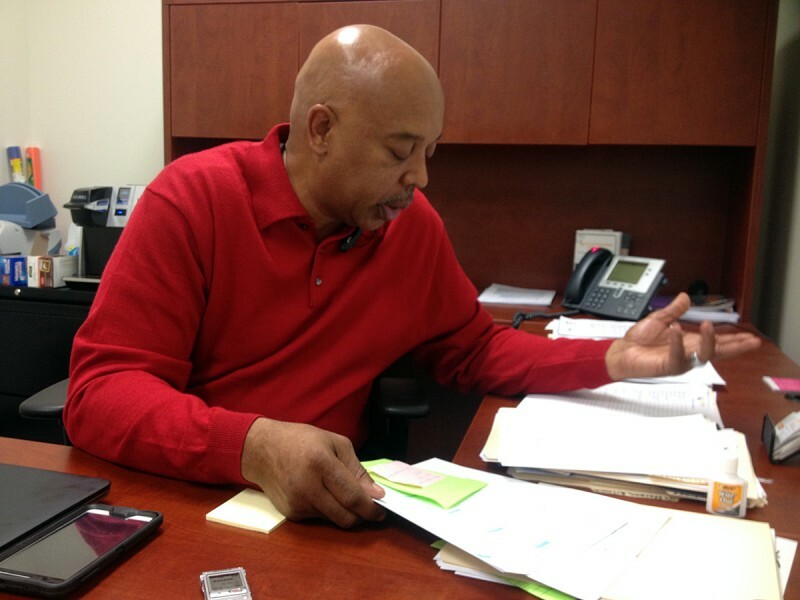 He spends his evenings and weekends visiting the homes of students who’ve gone AWOL or those considering enrollment – typically visiting seven homes a week, he says – so he can help remove logistical or emotional hurdles that are keeping students from class. If Pathways didn’t exist, he said, these young moms would be stuck at home alone with their babies. Katelynn Young was a 16-year-old junior at Detroit’s Denby High School when what she thought was a stomach virus led to a pregnancy test in the school’s infirmary. She panicked when she saw the fateful double lines. Then she took charge. When her mom wasn’t supportive, she took herself to the doctor. When her daughter, Dallas, was born in June, 2014, she made sure the little girl had health insurance and clothes. And when she considered her own future, she knew she’d have to find a way to finish high school. “Before I had a baby, I was not motivated. I winged my life. Now I plan, I think ahead,” Young said. She attends Pathways, and finds the online model a great fit. “It teaches you discipline and it teaches you everything you really need to know,” she said. Teachers are available if students need help understanding the material, but some students say it’s more difficult to learn without teacher-led lessons. Others students complain that it’s too easy to cram for the online quizzes, then forget what they’ve learned. Until the school recently blocked Google on its computers, some students would use search engines to find answers to quizzes, rather than refer to their notes, several students said. But many students interviewed at Pathways and Covenant House said they appreciated the flexibility to work at their own pace. But whether or not they like the online model, most Pathways students said they’re glad to have a school where they can be with students facing similar issues. Ponds, the young mother whose son Dominic loves pushing chairs in classrooms, said at Pathways, a school full of parents look after each other. Barbour, the virtual schools expert from Sacred Heart University, said that online schools don’t have the best track record for preparing students for college, but if done right, they can make a difference – especially for students coping with the special demands of parenting.